Petro Konovalenko is head of the village council in Sukachi, Ukraine. This afternoon, he shed his suit to help neighbors load hay into their barn. Half the people of Sukachi are Chernobyl evacuees, relocated here from the abandoned village Ladizhichi. This photograph is part of Michael Forster Rothbart's After Chernobyl documentary photography project. © Michael Forster Rothbart 2007-2010. 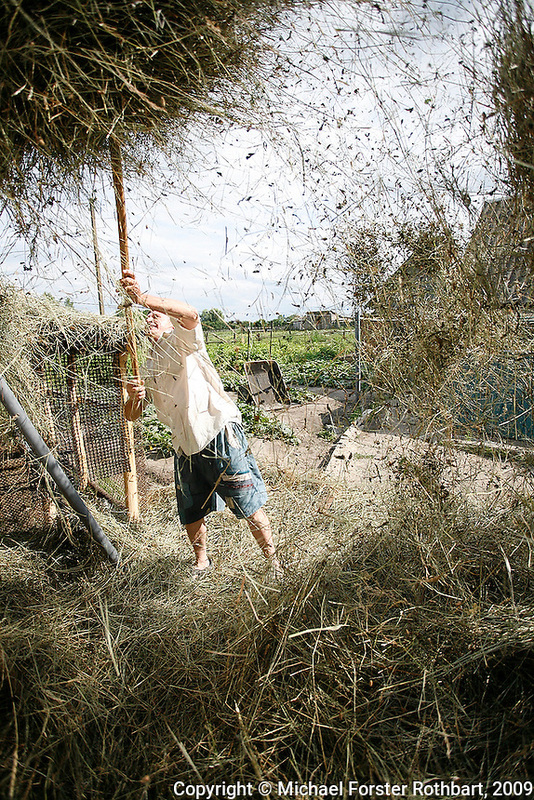 Original caption: .Photo title:.Bringing in the hay in Sukachi..Caption: .Petro Konovalenko is head of the village council in Sukachi, Ukraine. This afternoon, he shed his suit to help neighbors load hay into their barn. Half the people of Sukachi are Chernobyl evacuees, relocated here from the village of Ladizhichi...In the weeks after the Chernobyl accident, 91,000 Ukrainians were permanently evacuated from the Exclusion Zone. However, over 2,000 refused to leave or illegally returned as soon as they could. Nearly 400 remain today, among them the final six remaining inhabitants of the original Ladizhichi, deep inside the Exclusion Zone. .-------------------.